Practice number recognition and counting up to thirty with these printable worksheets, activities, and games. Count 21 houses. Write the number 21. Draw 21 stars. Write the digits in the number 21. Then tell whether it's an even or odd number. Write down how many 10s and how many 1s are in this number. Draw 21 tally marks. Complete the number line to show what comes after and before this number. Count 22 paper clips. Craw 22 hearts. Trace and write the number 22. Use a crayon to color in 22 ovals. Make 22 tallies and circle the number 22 with PV blocks. 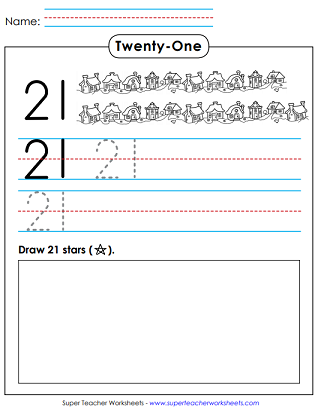 Trace, Print, Draw: Trace and write the number 23. Count 23 flowers. Draw 23 triangle shapes. Learn about place value for the number 23. Discover where 23 falls on a number line. Practice tracing the digits in 23. Can you see 24 dinosaurs in the picture. Write the number 24 and make 24 ovals. Color in 24 shapes. Trace and print the number and words for 24. Make 24 tallies. Tell if 24 is odd or even. Trace and print the number 25. The draw 25 diamonds. Is 25 even or odd? How many 10s? How many 1s? Some boxes on the number line are empty- fill them in. Color 25 circles. Count 26 seashells. Write the number 26. Draw 26 smiley faces in the box. Trace the number 26. Color 26 round objects. Complete the number line by showing what comes before and after 26. Count 27 marbles. Draw 27 check marks. Trace and print 27 on the primary-ruled lines. Color 27 shapes and make 27 tallies. Tell how many 10s and 1s are in the special number. Determine whether 27 is even or odd. Look carefully at the picture and try to count 28 screws. Trace and print the number 28. Draw 28 circles. Trace and write the digits in the number 28. Then tell how many tens and how many ones. After that, circle the base-10 blocks that show 28. Color 28 circles. Make 28 tally marks. The illustration shows 29 eggs in cartons. Trace number 29. Then draw 29 spirals. Tell whether 29 is odd or even? Draw 29 tally marks. Color 29 circles. Trace and write 29. Count 30 apples on the trees. Draw 30 zigzag lines. Circle the base-10 blocks that represent 30. How many 10s and 1s are in 30? Is this an even or odd number? Complete the number line. Complete the numbers lines by filling in the missing numbers. Numbers up to thirty. Fill in the missing numbers on the penguins. Includes numbers before and after. Up to 30. Connect the dots and create a picture of a jumping dolphin. Start at number 1 and keep going until you get to 30. Connect the dots to make a beautiful spring flower. A friendly sea monster appears when you connect the dots. Connect the dots to draw the Liberty Bell. Connect 23 dots and see a diving whale. 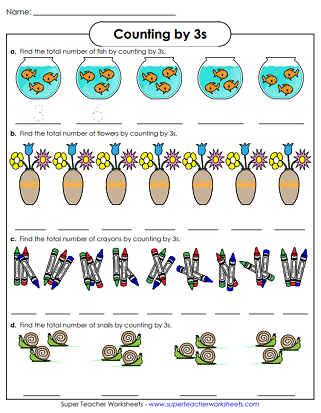 Students use the pictures of flowers, snails, and fish to help them skip count by 3s, up to the number 27. On this number line, students fill in the missing numbers. They will skip count by 3s, up to the number 36. These word wall cards fit perfectly in pocket charts too. 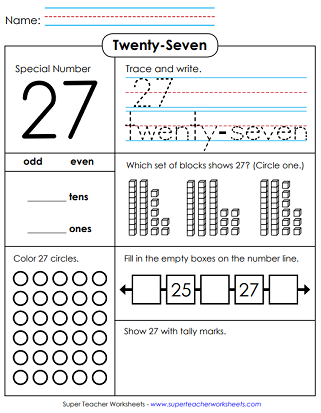 This page has worksheets for Numbers 11 through 20. There are also "counting up to 20" worksheets. This page have worksheets with Numbers 0-10. There are also some "counting to ten" worksheets. Here you'll find a large collection of "Connect the Dots" worksheets.